Get to Know Adelphi's March Students of the Month! Get to Know March’s Students of the Month! March’s Students of the Month were joined by their families for a very special assembly in their honor. BAY RIDGE – Adelphi Academy of Brooklyn’s prestigious “Student of the Month” program continued with a special assembly inside the John Lockwood Auditorium Theatre to recognize five outstanding students who demonstrated extraordinary effort during the month of March. 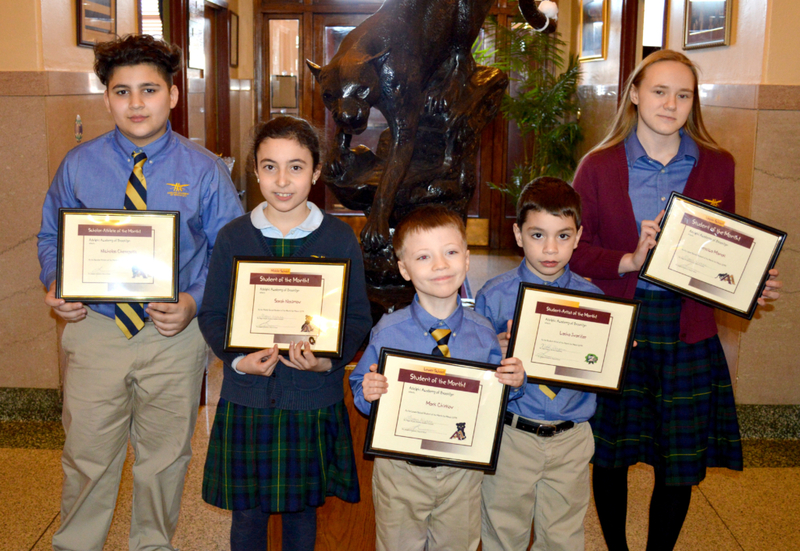 Mark (Lower School), Sarah (Middle School), Jessica (Upper School), Lasha (Student-Artist) and Nicholas (Scholar-Athlete) were each recognized in front of the entire Adelphi community and received official certificates signed by Head of School Ms. Iphigenia Romanos. They recently sat down with the Panther Press Room for an exclusive interview, during which they shared some details about themselves and their experiences at Adelphi. Lower School Student of the Month Mark can’t wait to be a grownup! That’s mostly because of his love of cars; he can’t wait to drive when he is an adult. When it comes to his taste in vehicles, Mark envisions himself in both stylish and pragmatic models. What kinds of cars will he drive? “A blue 2016 Mustang GT,” he smiled. “And a Nissan Altima!” As for his future career plans, Mark draws inspiration from his time at Adelphi. “I’m going to be head of school!” he said. “I’m going to be nice like Ms. Romanos.” At Adelphi, Mark is proud to say that he has a lot of friends and always works hard in class. Upper School Student of the Month Jessica is excited to be studying astronomy at Adelphi Academy. “I’m really into astronomy. I like to look at the planets and learn about them. I didn’t even know that would be the focus for ninth grade science when I came here, so that was really cool,” she said. Her interest in astronomy dates back several years to when her mother gave her some books on the subject as a gift. “I was fascinated,” she said. Jessica’s interest in science has led her to consider pursuing a degree in medicine, although she is also passionate about writing and hopes to become a published author at some point. “I write fiction,” she said. “When I was 11 or 12 years old I wrote my first fantasy story. I made up all my own characters and it was 20 pages long. My mom couldn’t believe I had written all that!” Her love of language extends even beyond English, as Jessica has been teaching herself to read and write Korean for the past several years. Why Korean? “A few years ago I started watching Korean shows on television and listening to Korean music, and eventually I started to understand what they were saying without the subtitles,” she explained. She became immersed in Korean culture and took a strong interest in the Korean national sport of Taekwondo. She excelled in her first tournament, winning two gold medals! “My goal is to become a black belt eventually,” she said proudly. As for her study of the language, she said there’s a plan for that as well. “Right now I can read and write it better than I can speak it, but my mom said when I’m fluent she’s going to organize a trip to South Korea and I can translate everything,” she smiled. Congratulations to Adelphi Academy of Brooklyn’s March Students of the Month! Student-Artist of the Month Lasha enjoys painting and drawing during art class, but considers himself to be more of a scientist. “I’m going to be a scientist!” he said. “I’m going to study volcanoes.” Lasha’s fascination with volcanic eruptions took center stage at the recent Lower School Talent Show when he donned a professional lab coat and conducted an experiment that had the audience enthralled. By mixing certain chemicals, Lasha was able to simulate a volcano that erupted right then and there. “It was amazing!” he smiled. “The talent show was so fun.” In his spare time, Lasha enjoys playing with remote control cars and helicopters, learning which buttons to push to achieve the desired result. “I play in the park. Right now I’m learning how to fly low,” he said. In addition to his painting and drawing, Lasha said he thinks his good behavior in class contributed to his being named Student-Artist of the Month. He credits his older brother Saba for setting a good example and helping him excel at Adelphi. “At home he helps me with my homework,” he said. Scholar-Athlete of the Month Nicholas mostly enjoys playing soccer and basketball. He is a skilled midfielder on the soccer field and a sharpshooter on the basketball court. “I like shooting three-pointers,” he said. Nicholas also has an interest in extreme sports like skateboarding and longboarding. He said he appreciates the values instilled in him through his athletic endeavors. “Through sports you learn teamwork and how to be a part of something,” he said. He was excited to learn that he had been recognized for his efforts and to share the good news with his family. “They were very proud,” he said. Nicholas has thought about becoming a lawyer, but said he is keeping his options open. He has a strong interest in photography, especially drone photography, which allows one to capture unique images. He recalls seeing an interesting photo of a snowboarder racing down a mountain with the sun peeking out through the clouds above. It was inspiring, he said. “That’s the best part of photography,” he continued. “People reacting to it.” At Adelphi, Nicholas enjoys Comic Book Illustrating class on Activities Day because “it lets your imagination come out and you can create a world with everything you want in it.” He also enjoys competitive assemblies like the Sports Bee, which he won, and the Riddle Bee. His advice to fellow Adelphians seeking “Of the Month” accolades? “Try your best no matter what,” he said. Congratulations once again to Adelphi’s outstanding “Students of the Month” for March: Mark, Sarah, Jessica, Lasha and Nicholas!